FOREX trend following is the trading method the professional traders use but very few retail or new traders, use this method but they lose money so don't let the fact its not popular bother you. The world's most successful traders use it and if you do to, you will be in good company. 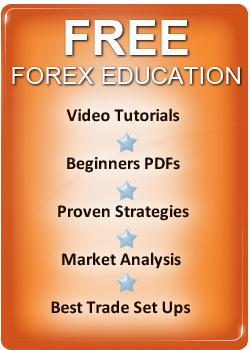 You can get a FOREX Trend Following Course which you can try risk free on this site. Here we will look at the basics of trend following, some free trend following systems you can use for profit and how to devise a long term trend following strategy which you can trade in just an hour a day to build long term wealth. Let's look at how to trend follow currencies in more detail. What is FOREX trend Following? Trend following normally refers to a method of trading which follows up or down moves in a currency pair which last anywhere from a week to a year or longer. The method is not dependent on perfect market timing and the trader will normally aim, to get around 50 – 70% of the trend which will make him huge profits. A trader who follows these big FOREX trends, tends not to trade very often but in terms of effort to reward, it's the most profitable way to trade currencies. If you want to know, why trend following in currencies works just look at any currency pair you want, over the longer term and you will see trends which last for long periods of time. Big FOREX trends will always be present in the market and are a reflection of the bigger economic cycle, in the countries the currencies represent. Greed or fear also drive these trends which always make them, last longer than most traders think. What comes as surprise to most traders is - there are two free FOREX trend following systems which make huge profits. In fact, the two systems which are Richard Donchian's 4 Week Rule and the Turtle trading rules, will beat just about every commercially sold robot or FOREX trading system. Enter trades on breakouts from ranges to new highs or lows. All big trends start by breaking to a new price high or low and do so as the trend matures. This method doesn't give you perfect market timing but it does give you the best odds of success so use it. Use some momentum indicators to confirm your trading signals. There are plenty to choose from but just pick 2 or 3, use to many and you will miss moves or generate false signals. Set a stop loss on entry and keep back behind resistance or support where other traders, will have their stops so you don't get stopped out, by normal counter trend action. If you follow the above simple guidelines you will have a simple trading method which you can execute in less than an hour a day which can generate you great long term profits. The most lucrative form of trading and also the toughest way to trade. If you look at FOREX trends, you will very often see trends that last for months or even years yet, very few traders have the mental discipline to hold these trends long term. FOREX trend following requires patience, to wait for and enter these trends when the risk to reward is at its best and then, have the mental discipline to follow them. Because most traders are not mentally not prepared to accept big gains, this may seem a strange comment as all trader want big gains but most traders simply cannot handle short term retracements against them. Most traders get excited when they get an open profit and the bigger this profit becomes, the bigger their temptation becomes to take it, before it gets away or turns into as loss. As the profit becomes bigger, pull-backs become more severe and erode open equity. Finally, the trader submits to his emotions and banks a small profit but if they had the discipline to hold the trade, they could have banked a huge profit. If you are long term trend following, you need the courage of your conviction and tremendous mental discipline to ride out the counter trend swings which will occur within the big trend and hold. FOREX trend following is tough mentally but the rewards are immense if - you adopt the right trading psychology. You need to be patient when timing entry levels and you also, need to be able to psychologically handle, short term severe dips in open equity, its not easy to do but if you do it, the rewards are immense. FOREX trend following is the best way to make money trading currencies and requires very little time to do. To win with a FOREX trend following system, you need to have the patience to wait for the right trading signals and the discipline, to hold these trends for long periods of time and ignore short term pull-backs in equity against you. If want to be engage in currency trend following, you should read up on Dow Theory which will give you an insight into the logic of trend following and for inspiration, read about some of the Best FOREX Traders who have made huge profits from trading currencies longer term. You should study traders such as Mike Covell, Curtis Faith, Victor Sperandeo, Jimmy Rogers, George Soros, Ed Seykota, Richard Dennis and Richard Donchian, to name just a few, of the best FOREX traders who use trend following systems. If you want to enjoy currency trading success, use the strategy the best FOREX traders do and trend follow the currency markets for long term profits.